The introduction of carfilzomib in the treatment of relapsing and refractory multiple myeloma has allowed a significant increase in survival. The most frequent adverse effect of Carfilzomib treatment is arterial hypertension, even though the exact physiopathological mechanism are still unclear. MM patients, on the other hand, often present significant cardiovascular risk factors and comorbidities. Uncontrolled hypertension is frequently the cause of cardiovascular complications. It has been estimated that up to 50% of subjects in the general population are unaware of their hypertensive condition and only half of those who are aware of this risk factor present good control of blood pressure. 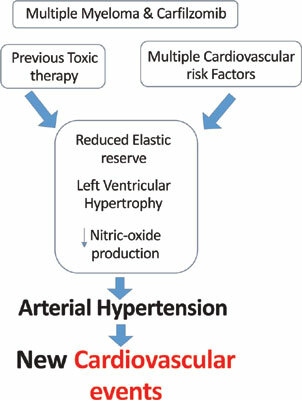 Although the management of arterial hypertension is clearly important in reducing the risk of cardiovascular events, and is well described by the current guidelines, no clear indications are provided on how to approach and treat specifically MM patients undergoing treatment with proteasome inhibitors. The aim of our work is to summarize a practical approach to the stratification of cardiovascular risk of hypertensive in patients who are candidates for or actively treated with carfilzomib for refractory multiple myeloma (MMR). MM patients eligible for carfilzomib treatment should preliminary undergo a careful cardiovascular risk stratification. Perspective studies will help to better identify the specific risk factors that should be considered and treated in these patients. Arterial hypertension, cardiovascular toxicity, carfilzomib, multiple myeloma, cardiovascular risk.